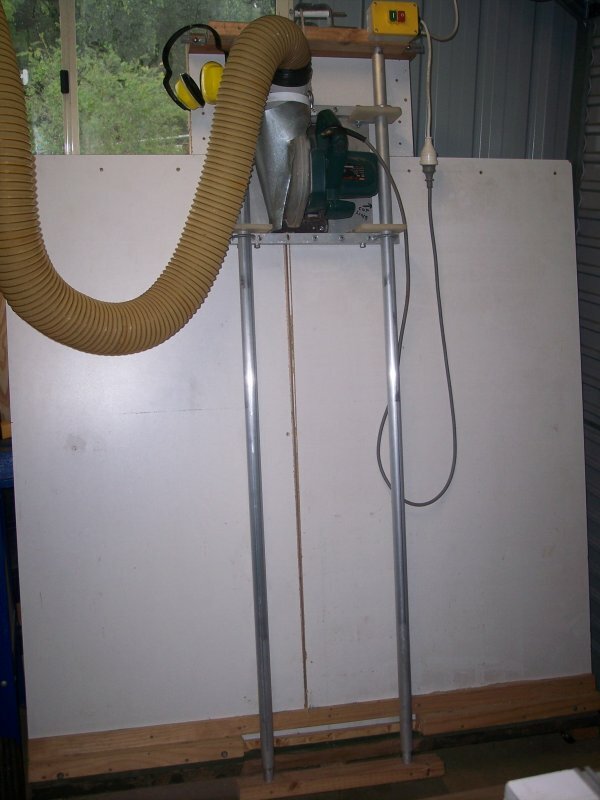 I built my Wall Saw to make the accurate cutting of sheet material very easy. It has also proved to be great for trimming and squaring Table Tops after glue-up. The wall saw is one of my favourite tools. I made it after seeing one at Bunning's. You can buy plans of the Web but after looking at them I thought it would not be that hard. Below is the Reader Digest condensed version of how to build one. Get some aluminium thick walled pipe for the rails and some alum. plate and square pipe for the Saw Holder/Traveller. 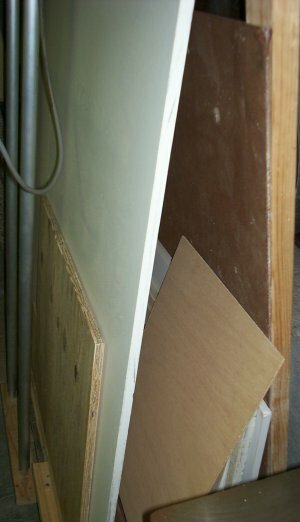 The saw table (backing board) is just melamine sheet with an A frame support. The saw is my old Ryobi 7 1/4" which should get some new bearings and brushes real soon. 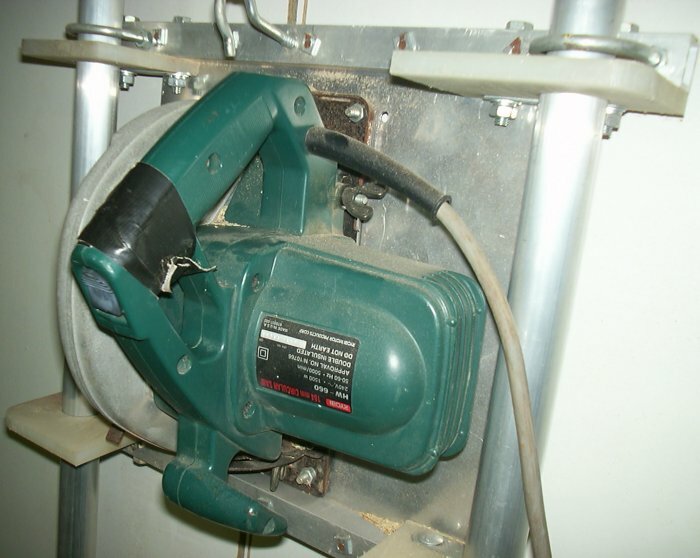 A couple of things are also needed, the Saw needs a counter-balance which hangs down the back of the unit. I found an old sash window weight (the old cast iron ones) as the salvage yard. (I actually got two but found that one was just right.) The Saw is perfectly balanced and will sit at any position. For the Saw Traveller, I just used some alum plate with square alum cleats top and bottom. The Traveller is connected to the rails via four pieces of plastic obtained from - (don't laugh, frown, etc) - two very, very thick old Breadboards. I forget the name of the plastic but it is very strong when it is thick and this is the cheapest way to get it. Anyway, these pieces have holes cut in them exactly the same size as the Rails. As the plastic is slippery but not flexible, the saw moves up and down very well and accurately. Just for safety, I have four U-Bolts around the rails as well. I put these on as insurance but the saw has been in use for over two years now and I check it regularly and the plastic has not worn at all. The top support that holds the Rails is designed to be moved left or right and then locked in by two big screws. This is to align the saw. To align it initially, I used a new sheet of melamine that I check with a framing square and then placed on the saw. I ran the Saw Traveller down with the Blade retracted so that it did not cut into the Saw Table but was just above it and I could see it travel along the edge of the melamine sheet. A little adjustment at the top and then lock it down when the saw travelled along the test sheets edge perfectly. Once that is done, its time to cut the saw slot in the table. Move the saw to the top, turn it on and slowly lower it into the Table. When it is fully lowered lock it in and pull the saw all the way down the rails. Result, one zero clearance slot. Last couple of things, my saw is mounted on casters so I can move it around nice and easily however, when I do, I recheck the alignment. This is actually recommended for the commercial units as well. The other thing is that behind the saw table (i.e. in the A Frame) I store my Sheet goods. This saves lots of space, keeps them of the ground and upright which are all really good things. trimming glued up table tops.